Did another talk-radio interview at a South Dakota station (KORN/KQRN) on Thursday. But the biggest news of the week was my return visit to the Barnes & Noble in Salem, NH. A week before Christmas I did a book signing event at this store and the managers told me that it was the most successful author appearance there for all of 2015. 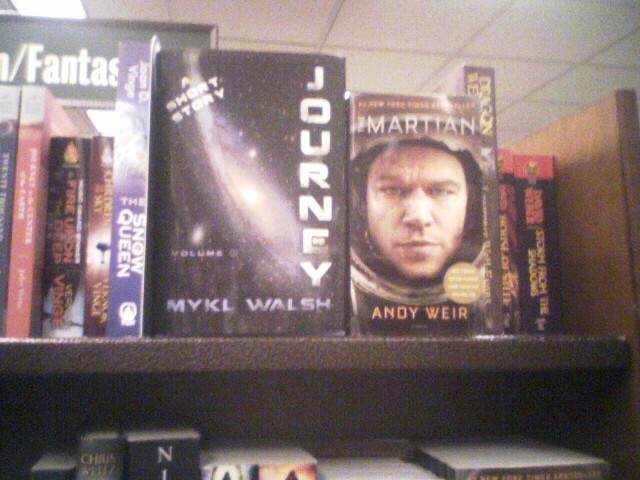 At that time my book was set up on a table at the front of the store - so a few days ago I went back to see where Journey had been placed on the shelves for the longer term. As we all know, the vast majority of books are displayed so that you can only see the spine of the book, so the chances that any individual book will stand out from the rest is minimized. You can imagine how psyched I was to see that Journey was one of the few to recieve the highly coveted "face-out" status! That alone is pretty exciting, but in addition to that, by pure coincidence my book just happens to be displayed next to the current best-selling title in the sci-fi / fantasy section! This happened because books in each genre are shelved in alphabetical order by author last name. So the decision to give my friend Mykl Walsh the cover credit led to an unexpected major benefit. Volume I of my serialized novel, SecretAgentMan is "hidden" inside the short story Journey and there is no mention on the cover that my work is what most of this book actually contains. If you've figured out how cool and ridiculously complex this story is yet, feel free to share it here on Inkshares and on your social media feeds!